The cover price is US$30.00. This book contains 124 pages. Reprint Information: Number of pages = 4. Download for free pp 559-562. Reprint Information: Number of pages = 5. Download for free pp 563-566. Reprint Information: Number of pages = 14. Download for free pp 567-579. Reprint Information: Number of pages = 9. 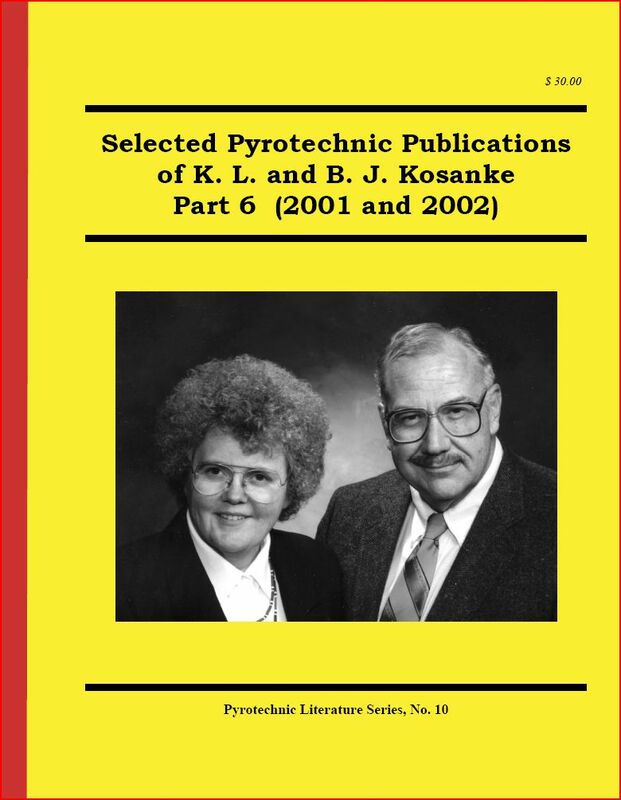 After the 1999 PGI convention, the authors were told about a type of quick match that had been sold at the convention and which was suspected of being made using a chlorate oxidizer. The individual’s suspicion was based on his perception of its extremely fast burn rate. Subsequently, a sample of that fuse was spot tested and found to contain a nitrate but not a chlorate. Sometime later, the authors were given a sample of quick match thought to be of the same type. The burn rate of the quick match was observed to be most vigorous; however, there was not a sufficient amount for the authors to make a usefully quantitative measurement of its burn rate. Small amounts of the composition were removed from the black match portion of this fast burning quick match, and two tests for the presence of chlorate were performed. The first test was the concentrated hydrochloric acid test, in which a few drops of the acid are placed on the composition. The presence of a chlorate is revealed by a modest rate of chlorine dioxide gas production, with its characteristic color and odor. The second test was the analine-HCl spot test, in which some of the composition is dissolved in a tiny amount of water, the water is decanted and treated with a drop of analine-HCl test reagent. The presence of a chlorate is revealed by the appearance of first a red then blue color. Again, both test results were negative for the presence of a chlorate. Accordingly, another possible explanation for the vigorous burn rate of the quick match was sought. Reprint Information: Number of pages = 3. Download for free pp 589-591. Reprint Information: Number of pages = 4. Download for free pp 595-598. It had been speculated that the replacement of fierce burning quick match shell leaders with electric matches might have contributed to the production of a significant number of low breaking aerial shells experienced by a small fireworks display company. A preliminary study of the effect of ignition stimulus level did not supporting the theory that the weaker stimulus provided by electric matches (possibly in conjunction with Chinese lift powder) was the reason for the low breaking shells. However, that study was thought not to be sufficiently conclusive to completely settle the question. Accordingly, a more extensive series of tests were subsequently performed. For these tests, because of the lack of sufficient Chinese lift powder, Goex (USA) Black Powder was used. The result of these tests was that again no effect was observed for the flight times of the test aerial shells. The average flight times for groups of approximately 30 of the 75- mm (3-in.) test shells was 9.65 ± 0.13 seconds and 9.58 ± 0.17 seconds for shells using quick match and electric match firing, respectively. A while ago, a small fireworks display company called seeking information about the effect of mortar internal diameter on the burst height expected to be achieved by aerial shells fired from them. It seems the company had received a large quantity of three-inch, high-density polyethylene (HDPE) pipe that they had cut into 18- inch lengths for mortars (including 1.5-inch thick plugs) before having checked the pipe’s internal diameter. When it was checked, the HDPE pipe was found to have an internal diameter of 3.21 inches (i.e., it was significantly oversize). Because it was close to the July 4th holiday season, there was not sufficient time to replace the pipe. Accordingly, the question was, could these mortars be safely used? Reprint Information: Number of pages = 3. Download for free pp 607-609. Reprint Information: Number of pages = 21. Several years ago the US Department of Transportation granted an exemption that, under certain conditions, “authorizes the transportation in commerce of Division 1.3 and 1.4 display fireworks with igniters (electric matches) attached to either the fuse or the lift charge.” Because of concern regarding one of the specific provisions of that exemption, a brief study was undertaken. This short article discusses that concern and reports on the results of the study. Reprint Information: Number of pages = 3. Download for free pp 637-639. Reprint Information: Number of pages = 3. Download for free pp 642-644.